Da Bears Blog | Money Mitch Took A Big Step. Money Mitch Took A Big Step. Facing a third-and-four, the Bears young quarterback had nowhere to go. Consecutive touchdown drives and a day full of special teams mistakes put the Bears in a curious position with just about six minutes to go. If they don’t get the first down, the Lions get the ball back with about five minutes left in the game – plenty of time for Matthew Stafford to orchestrate two touchdown drives. Detroit rushed four and had former first round pick Jarrad Davis spying Money Mitch. He didn’t have anywhere to go. Then he made something happen. 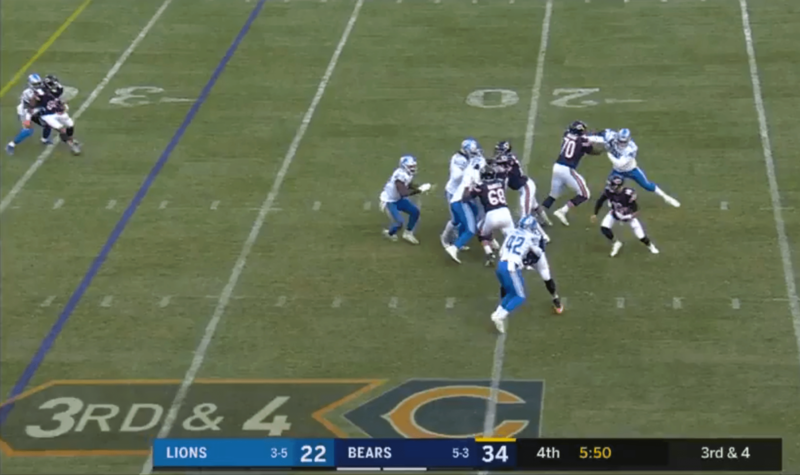 Trubisky tucked the ball and moved slightly to his left, just enough to make Davis move. Once Davis reacted, Trubisky jetted off to his right into a open space. He picked up the first down then slid for a gain of eight. Pro Football Focus and Football Outsiders won’t know how to give Trubisky full credit for that play. They’ll say it was fine, but won’t properly credit it as a football play because Trubisky is a quarterback and quarterbacks are supposed to throw the ball. Some would say quarterbacks have to throw it through a keyhole. Those guys aren’t in the league, though. What Trubisky did in that one play is show the instincts needed to play the position at a high level. What he did throughout the rest of the game, is show he’s got more than enough arm talent to get the job done. Later in that same drive, Trubisky went through his progressions before finding Anthony Miller for a first down on a third-and-five play. It wasn’t flashy, it wasn’t a special throw, it wasn’t anything that will be put on highlight reels, it was just a football player making a winning play. That was the case for Trubisky last week and has been the case for most of the last six games. He had horrendous box score numbers against Buffalo so the self-proclaimed experts went after him, showing they clearly didn’t watch the game. Against Detroit, there is no room for interpretation: The QB was great and that’s the end of the story. The Bears weren’t counting on Mitch doing this in 2018. This was supposed to be a year of growth while the running game along with defense and special teams carried them. None of those units were at their best on Sunday and they didn’t need to be because the Bears got a special quarterbacking performance, the kind we rarely see in these parts. We can downplay the Lions all week long, the reality is this was a big game for the Bears and their young quarterback. When the Bears needed a big play, Mitch delivered. I don’t know what this means going forward, but it certainly isn’t a bad thing. The biggest game of Mitch’s professional career so far is coming this Sunday. The Bears need him to play at the same level he just did. If he can do it again, they’ll be a shoe-in for the playoffs and open up a two-game lead in the division. His skeptics won’t go away, but we don’t need them to. We just need the QB to keep playing like a stud.